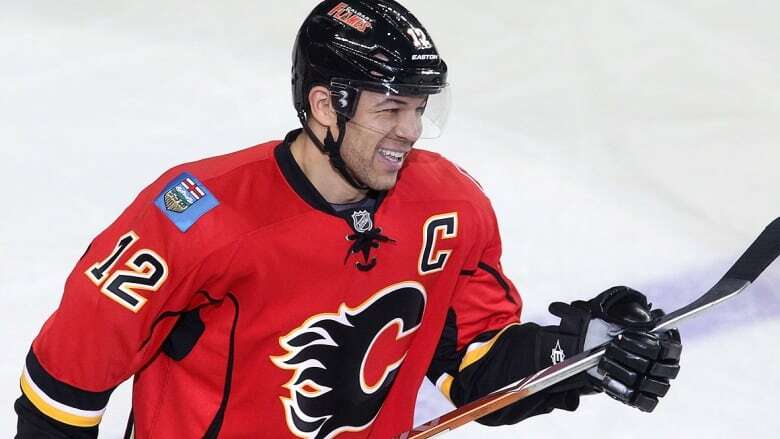 The Calgary Flames will retire the jersey of legendary former captain Jarome Iginla on March 2 prior to the team's game against the Minnesota Wild. Iginla announced his retirement on July 30, 2018, after 20 seasons in the NHL. His jersey number is 12. "It's humbling, a huge honour, a thrill and to be honest, a little bit surreal," Iginla said in a statement Thursday. "I am extremely grateful to the Flames ownership and organization for bestowing this tribute on me and my family." "I'm looking forward to it but I don't know what to expect or how I'll handle my emotions. I'm obviously very excited but I think now that my kids are really into hockey and the NHL that it's going to be so neat to share it with my family. "To have them there, and friends, alumni and of course with the fans will really make the day special." The 18th captain in Flames history, Iginla scored 525 goals and potted 570 assists for 1,095 points in 1,219 games with the team. He twice scored 50-plus goals in a season — and notched 30-plus goals 11 times. He's considered one of the best power forwards of his generation. "We are all so proud of Jarome, a gentleman and extraordinary player. On behalf of the Flames ownership and the organization, we congratulate Jarome on an amazing career," Calgary Sport and Entertainment Corporation vice-chairman and CEO Ken King said. "For 16 years Jarome was the centerpiece of our Flames culture. He set the standard and established a legacy that will be cherished for years to come. He conducted himself with grace, humility and dignity matched with fierceness and passion in his play". A native of St. Albert, Alta., Iginla spent his junior hockey career with the Kamloops Blazers in the WHL and was selected 11th overall by the Dallas Stars in the 1995 NHL entry draft. He was then acquired by the Flames, along with Corey Millen, on Dec. 20, 1995, in exchange for Joe Nieuwendyk. Iginla made his NHL debut with the Flames during the 1996 Stanley Cup playoffs, recording his first point in his first appearance, an assist on a goal by Theoren Fleury against the Chicago Blackhawks. Iginla's first NHL goal came in his second game. He was named to the NHL All-Star team six times and holds a number of team records for the Flames, including games played (1219), goals (525), points (1095), even strength goals (351), power play goals (161) and game-winning-goals (83). Iginla is second overall in assists (570) and third in short-handed goals (13) and hat tricks (12). Iginla was traded to the Pittsburgh Penguins in 2013. He also suited up for the Boston Bruins, Colorado Avalanche and Los Angeles Kings. Iginla finished his career with 1,300 points, including 625 goals and 675 assists in 1,554 games. He also won two Olympic gold medals, and was a member of Team Canada when it won the 2004 World Cup of Hockey.